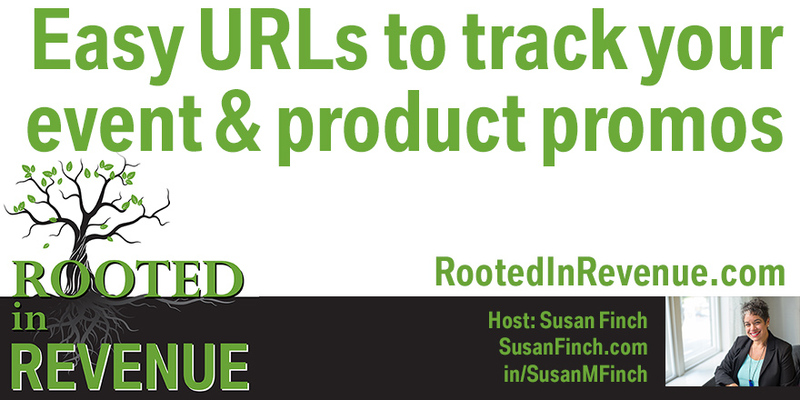 Use easy URLs to track your marketing efforts for events, books, products, campaigns. How do you know if your marketing dollars are leading to revenue unless you can track it? Even small businesses that have one or two events a year need to be tracking how their efforts pay off. Sometimes we pay for ads in directories, sponsor events, sponsor a local team of kids, put an ad in the church bulletin, boost our listings in the Chamber of Commerce or other business organization listing. Don’t you want to know if it worked? Don’t you want to know if people not only saw the ad but clicked on it? Sometimes these sites and situations have strict guidelines as to what the links can go to. Sometimes you need to be able to SAY the link out loud from a stage, podium, on a podcast, over lunch - don’t make it difficult. If you know you’ll be SAYING your domain regularly or one to promote your event, make sure you get a domain that is easy to spell, remember and SAY. How many of you have ever heard on a podcast, video or show, “How can listeners get in touch with you?” and the guest stumbles out a clumsy answer, “Go to our home page: www.mycomplexdomainspelledweirdly.com and then click in the left on the button that says, “special event”. www - your domain needs to resolve with and without www. Your domain needs to be LOGICAL and EASY to say and spell. None of this Eleet E - l - e - e - t Realty type of stuff. If the real way to spell a word is gone, think of a new domain. We can’t all have .com. Your call to action link cannot require you to then explain where they can FIND the information to click again. That final destination page needs to be the domain. Let’s talk about resolving #4. Create a subdirectory link: healthychoiceswemake.com/jamboree18, or just jamboree to always use the same URL year after year, but update the content. OR an entirely clean URL: HealthJamboreePDX2018 .com that would redirect to either a landing page in your main site, or be a specific site JUST for this event with cross linking from your main site. So many options. Your plan all depends on your vision for the event, Is it a one time, or the first of many recurring each year or in different regions. You’ll want to plan for this type of repetition or growth when you secure your unique domain so you can follow the pattern. Keep in mind regional uses of abbreviations. Up in Portland Oregon, PDX is a common way to shorten Portland and surrounding areas. It’s the airport call letters. That won’t work well in Los Angeles - LAX because that’s also an abbreviation for the sport, Lacrosse. A lacrosse jamboree is way different than the topics in our health jamboree, but the search results may confuse and irritate those that click if it’s not completely clear. Is this for a BOOK? A book always needs its own website with a way to purchase EVERY format: print, ebook, kindle, itunes, etc. AND you need a form that will collect information and add them to a drip campaign regarding the book, the tour schedule, appearances, tips from the book and more. BUILD and sustain buzz. Register, subscribe, buy, answer a quiz, watch a video, etc. Some website themes have built in squeeze page templates. Many CRM services offer squeeze pages with unique URLs for sharing and tracking. These same rules applies to hashtags for your initiatives, products and events. It’s OK to ride the hashtag others have used for related topics, but for your unique application and tracking purposes, be very careful and make sure it’s not already in use by a competitor, something unsavory altogether or something that is viewed with disdain by all or offends your target audience. Acronyms can be a messy place to tread. A good tool is Keyhole: http://keyhole.co/ You can utilize their free trial to make sure your hashtag is safe to use. Hashtracking (https://www.hashtracking.com/pricing/ ) is another service. ROOTED TIP: When you sign up for free trials, you usually have to give a credit card. Mark a LOUD reminder on your calendar for the day or two before so you END the trial and remove your card from their system if you don’t want to have it automatically charge your account. You need to know WHO is going to your landing page, using your hashtag and from where. The easy way is to add this landing page URL, unique URL into your Google analytics. If your squeeze page is contained within your website, you’ll need to add the Google Analytics code into the page code to track it. This will also give you information as to their journey from your main site and what they did after. Remember to add it to your Search Console, as well - be specific with the domain - https:// - if your landing page is within your main site using a subdomain or subdirectory domain/xxxx then the existing SSL you have will most likely cover it. Confirm if you are going the subdomain route: myevent.mydomain.com Some cheap SSL certs won’t cover that. Also, if you have a payment gateway associated with the event, book, etc. can you track THAT part of it? Revenue and sales driven by marketing, sales skills and events.